Gas-Liquid Mixture Pumps are becoming a great solution in the today's industrial marketplace. The ability to mix via a special impeller design and a specific amount of gas for suspension in liquid has revolutionized many industries including wastewater, livestock production, oil and gas and separation technology. 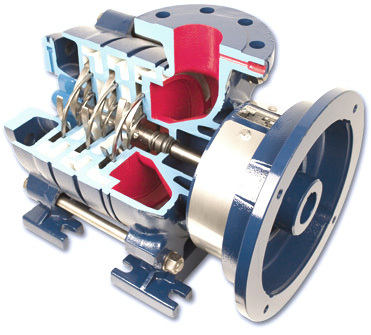 Centrifugal pumps are typically used in the transport of pure liquids. However, this ideal of liquid purity is not often found under real working environment conditions. In a great number of engineering applications today, varying mixes of liquids and gases may occur and must be moved. Generally liquids have to be pre-charged with gases involving the use of compressors and storage tanks before a suitable mix can be achieved and then pumped. Shanley Pump and Equipment caries a full line of specialized multiphase pumps that reliably entrain gases into liquids without the need for old technology of compressors and tanks, simply the pump. Gases such as oxygen, nitrogen, ozone, CO2, hydrogen, and more can now be controlled and reliably mixed in situ at your facility with less need for other equipment. 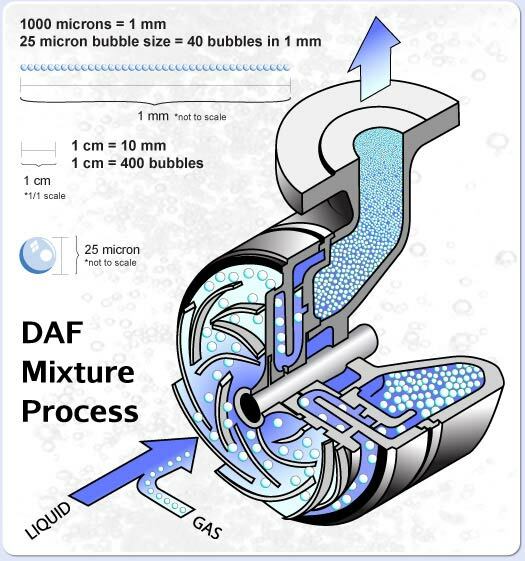 For applications such as Dissolved Air Flotation (DAF) pumping, EDUR's DAF pumps are an ideal candidate for your requirements. 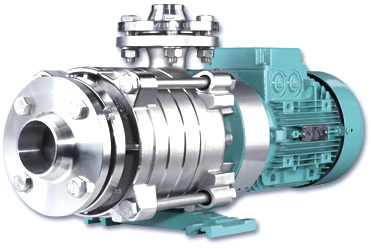 Under conditions of mixing gases and liquids, ordinary non-self priming centrifugal pumps designs either break down or will not allow reliable operation. Such failures basically have their roots in the impeller design. With increasing gas content, more and more stationary gas is created at the center of the impeller. This finally blocks the impeller entry of liquid and interrupts the supply output. Even with slight gas content, the characteristic curve is no longer stable. 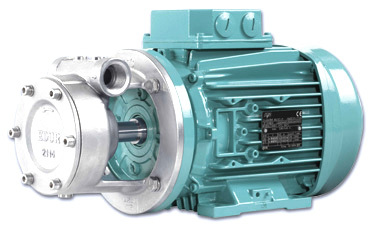 Therefore, standard centrifugal pumps are not suitable for such difficult working conditions. 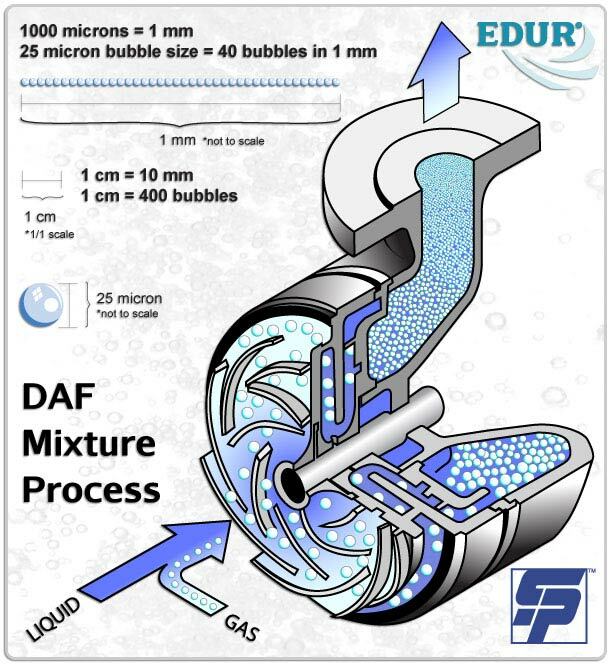 EDUR additionally manufactures a Ozone Mixing Peripheral Pump for DAF applications, the PBU Series. Today's factory operations call for increased reliability and trouble-free pump operation for longer periods between maintenance. 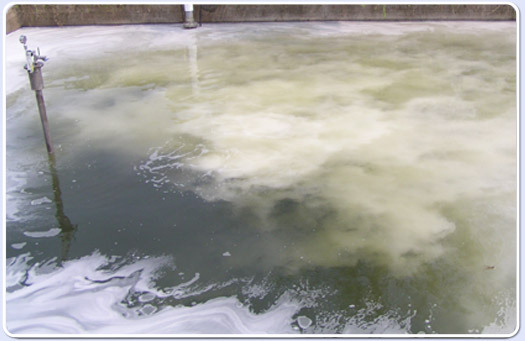 Difficult applications like these are solved by the use of EDUR multiphase pumps for Gas-Liquid Mixtures. EDUR Multiphase pumps mix three jobs in one, pumping, gas entrapment and mixing! Contact us today for more information about out Multiphase Centrifugal Gas-Liquid Mixture Pumps.